Free Shakespeare on the Common has been a tradition on Boston Common for the past 22 years. This year the company presents “Richard III” an intense drama that follows the ruthless climb of the king and the devastation he leaves in his path as he gains power and control over the kingdom. 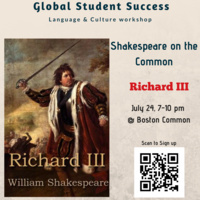 We will meet as a group and discuss the play and this tradition in Boston, come join us!